Milk fermented with YF-3331 (containing Streptococcus thermophilus and Lactobacillus delbrueckii ssp. bulgaricus) and a probiotic strain of L. acidophilus La-5 and the effect of different variables were evaluated on the growth of three bacteria in period of 6 hours of incubation. Beet was added to the yogurt at 15% as prebiotic. The effect of variables including skim milk powder, whey powder, inoculum size, L. acidophilus inoculums, and incubation temperature was evulated by Taguchi approach. The results showed that the growth of L. bulgaricus was much higher than others. L. acidophilus showed the lowest growth after the incubation time. Although milk composition had no significant effect on the bacterial growth, increasing whey powder in the milk base enhanced the growth of L. acidophilus slightly. By increasing L. acidophilus inoculums, L. bulgaricus growth was restricted and yoghurt bacteria restricted the growth of L. acidophius. L. bulgaricus, S. thermophilus and L. acidophilus showed higher growth at 37, 40 and 43°C, respectively. This approach provides some useful information to set the best situation for the probiotic growth during fermented milk production and reach much higher level of cell growth after the incubation. During the past twenty years, the trend of dairy food manufacturers has been to incorporate probiotic bacteria into some fermented and non fermented dairy products. This is primarily due to potential health benefits attributed to their consumption . Lactobacillus acidophilus is involved in the production of many fermented milk products with claimed probiotic value such as reduction of lactose intolerance, increase of mineral absorption, induction of the anti-carcinogenic activity, control of the intestinal infections, stimulation of the immune response system and reduction of blood serum [2,3]. In order to exert positive health benefits, the probiotic bacteria, the viable cell count should be above 6 log cfu/mL of a product by more than 100 g per day consumption in order to supply a sufficient daily dose of 108–109 viable bacteria [4,5] Unfortunately, this recommended level of probiotic bacteria is not always obtained in commercial products due to the slow growth and poor viability of these bacteria in milk products . It has been shown that several L. acidophilus strains grow slowly in milk because of the lack of the proteolytic activity. Thus, the probiotic count remains low and milk fermentation is slow with probiotic cultures . Therefore, the production of fermented milk products using probiotic lactic acid bacteria is a major challenge to dairies as milk is not, on the whole, a good growth medium for these organisms. Several works have been done to improve the growth and acid tolerance probiotic bacteria by acting on milk base. It is well documented that various substances can stimulate the growth of certain strains of probiotic and yogurt cultures in milk [8,9]. Some of these substances can serve as a source of nutrient-rich peptides and amino acids are required for the growth of various strains of lactic acid bacteria, especially the probiotic bacteria. The addition of non-protein nitrogen is also useful to maintain a short fermentation [10,11]. More researches were done to know about the effect of whey protein on the growth of probiotic bacteria in milk. The choice of starter culture such as S. Thermophilus and L. delbrueckii ssp. bulgaricus seems also to have a positive or negative effect on probiotic growth, depending on involved protocooperation, inhabitation, or competition phenomena [12,13]. L. delbrueckii ssp. bulgaricus produces essential amino acids because of its proteolytic nature, and the symbiotic relationship of L. delbrueckii ssp. bulgaricus and S. Thermophilus is well established; Addition of yogurt culture has provided evidence for enhancement of both growth of (i.e. higher viable counts and shorter generation times) and activity by (i.e. improved sugar utilization and lower pH) L. acidophilus. However L. delbrueckii ssp. bulgaricus also produces hydrogen peroxide and lactic acid during refrigerated storage. This phenomenon is found to cause loss of viability of probiotic bacteria . Moreover, the amount of inoculum is important for a normal acidification process and to ensure a desired level of final bacterial count at the end of fermentation and during the cold storage of the product . Furthermore, fermentation temperature primarily affects bacterial growth and thereby the structure and flavour of the product . Choosing carefully the appropriate temperature, satisfactory levels of the probiotic strain is feasible . So, formulation, starter and co-culture as well as fermentation condition specially temprature have strong effects on growth and acid tolerance of probiotic bacteria in milk. Beet which usually is eaten with yogurt in Iran and has various health beneficial properties had never been studied as a prebiotic component. The objective of this work was to study the effect of milk supplementation (with skim milk powder and whey powder), starter culture composition (with L. acidophilus and yoghurt culture in pure and mixed culture) and fermentation temperature on bacterial growth (growth of L. acidophilus, L. delbrueckii ssp. burglarious and S. thermopiles), acidification and pH decrease of a probiotic fermented milk, after 6 hours of incubation. Two commercial starter cultures were used in this study: L. acidophilus La-5 as the probiotic strain (Single strain, DVS culture, Copenhagen, Denmark) and YF-3331 as yoghurt culture contains L. delbrueckii ssp. bulgaricus and S. Thermophilus (Mixed DVS culture, Chr. Hansen, Copenhagen, Denmark). Each package of freeze-dried YF-3331 culture (50U) was suspended in 1 liter of 10% reconstituted skim milk powder that was heat treated at 95°C for 15 min, and used to inoculate the milk samples. Freeze-dried pure culture of L. acidophilus (25 g) was inoculated by weight measurement. The chemical properties of skim milk powder (IDIC, Tehran, Iran) and sweet whey powder (IDIC, Gorgan, Iran) used for the manufacture and supplementation of fermented milk were evaluated as they follow: Protein content derived from total nitrogen using the Kjeldahl method (AOAC, 2002); Fat content, using Gerber method (AOAC, 2002); Acidity (AOAC, 2002) and pH value (digital pH-meter, micro-2000, Crison Instruments S.A., Barcelona, Spain). Eighteen fermented milks were prepared according to a Fractional Factorial Design (Taguchi Approach, Qualitek-4 Software). The Fractional Factorial Design permits to reduce the number of possible combinations to a manageable size. In fact, this design is characterized by using only a fraction of the total number of factor combination for experimentation . The independent variables were: Percentages of skim milk powder and whey powder added to the basal medium; Inoculum size of L. acidophilus and yoghurt culture; Incubation temperature (Table 1). The experimental design in the coded and actual levels of five variables and three levels for each variable is shown (Table 2). Thus, eighteen experiments were obtained according to Taguchi approach for five factors in three levels. Table 1. Levels of five variables for production of sinbiotic yogurt containing L. acidophilus LA-5 and beet. Table 2. Coded levels of five variables in three levels base on Taguchi approach for production of sinbiotic yogurt. Skim milk powder was reconstituted to 10% (w/w) and used as the basal medium. To obtain the levels required by the different runs of experimental design outlined in Table 1, suitable amounts of commercial skim milk powder and commercial whey powder were added to the basal medium. The mixtures were heat-treated at 90°C for 15 min, and cooled to 43°C in a water bath. Immediately after this step, the milks were divided into the aliquots (100 g), and inoculated with required percentages of the L. acidophilus and yoghurt culture. Then, the inoculated milks were fermented at different temperatures according to Table 1, for 6 h. The final pH, depending on the combination, ranged from 3.96 to 4.47. After cooling of fermented milks to 4°C, cutted beet was added to it. For each run of the experimental design, samples were analyzed immediately after inoculation, and at the end of fermentation. One milliliter of each sample was diluted in 9 mL of sterile Ringer solution (Merck, Germany), subsequently serial dilutions were prepared and counts of bacteria enumerated using the pour plate technique. Media allowing optimum differentiation or selectiveness between colonies of the microorganisms were chosen for each product. Counts of S. Thermophilus were enumerated on M17 agar (Merck, Germany) by incubating the plates aerobically at 37°C for 72 h . Enumeration of L. delbrueckii ssp. bulgaricus was carried out on MRS (Merck, Germany) agar at pH 5.2 by anaerobic incubation at 45°C for 72 h and selective enumeration of L. acidophilus was performed on MRS-Bile  by anaerobic incubation at 37°C for 72 h. The selectivity of the growth conditions was confirmed by the microscopic appearance of the cells from single colonies. Plates containing 30−300 colonies were enumerated and recorded as colony forming units per milliliter of culture (cfu/mL). Titratable acidity was measured according to AOAC, 947.05 (AOAC, 2002), and was introduced as Dornic degree. The pH was determined by direct measurement with a MicropH 2000 pH meter (Crison Instruments S.A., Barcelona, Spain). The pH meter was calibrated using standard buffer solutions (Merck, Germany) at pH 4.0 and 7.0. Experimental desig was used to describe the growth in cell number of yogurt and probiotic bacteria (S. Thermophilus , L. delbrueckii ssp. bulgaricus and L.acidophilus), acidity increase and pH decrease, in the probiotic yogurt after 6 hours of fermentation, as the function of the independent variables of Fractional Factorial Design. Thus, 18 trials were conducted in randomized menner with three replications. Statistical analysis was performed by using data of microbiological growth; pH and acidity changes during production phase were subjected to one-way ANOVA analysis using the SPSS 11.5 software (SPSS Inc., Chicago, IL, USA). The Figures were drawn to illustrate the effects of the different levels of independent variables on responses. Skim milk powder used for the manufacture of fermented milk had an initial average protein content of 2.08%, fat content of 0.09%, the initial pH of 6.43, and the acidity of 0.20% lactic acid. The commercial whey powder used as supplementation had an initial average protein content of 0.51% and no fat content. The initial pH and the acidity were 5.95 and 0.16% lactic acid, respectively. The changes in viable counts of L. acidophilus, S. Thermophilus and L.delbrueckii ssp. bulgaricus are shown (Figure 1). In all trials of Taguchi approach, the three strains used as starters were characterized at the time of inoculation and at the end of fermentation, by a cell concentration higher than 4 and 7 log cfu mL−1, respectively (data not shown). The growth results of the bacteria are shown in Figure 1. In all the samples, the L. acidophilus La-5 concentration was between 7.72 and 8.89 log cfu mL−1 just after the inoculation and the final number after the fermentation period was between 8.40 and 9.15 log cfu mL−1 (data not shown). As shown in Figure 1, the mean growth rate of this bacterium, varied from 0.11 to 0.73 log units depending on the different conditions. Thus, the probiotic lactobacilli growth was affected by the variables and generally lowers than several values reported in literature, for instance Streptococci were present in all products at levels ranging from 6.40 to 7.20 log cfu/mL at the time of inoculation (data not shown). After the fermentation time, the population of this strain was between 7.26 and 9.05 log cfu mL−1 depending on milk base, starter culture and incubation temprature. The results showed that maximum growth of viable cells (for all strains) occured after 6 h incubation and increased cell count was in the range of 2.11 to 4.32 log units. Before fermentation, nomber of L. delbrueckii ssp. bulgaricus was (4.08 and 5.12 log cfu mL−1) depending on the trial, but rose to the highest viable cell number (7.04 and 8.54 log cfu mL−1) after 6 h incubation (data not shown). Figure 1. The changes in viable counts of Lactobacillus acidophilus, Streptococcus thermophilus and Lactobacillus delbrueckii ssp. Bulgaricus. It is obvious that the growth of L. acidophilus La-5 falls behind those of the starter bacteria and this is considering that the growth of probiotic bacteria is generally not favoured in milk for reasons often reported in the literature  and in agreement with Shihata and Shah , yogurt bacteria grow faster in milk, whereas the probiotic bacteria grow slowly due to lack of proteolytic activity. Nonetheless, during 6 hours of incubation the population of these microorganisms in all the runs reached above 8.00 log cfu mL−1, the minimum level suggested by some authors for probiotic microorganisms in order to produce therapeutic benefits . As a large number of the probiotic strain is important to maintain high levels of it during storage it was interesting to study the effect of factors under investigation on the growth number of L. acidophilus and yogurt cultures during fermentation. As noticed by Dave and Shah (1998), the milk base had an effect on probiotic growth. The results of this study about the effect of adding skim milk powder and whey powder on the bacterial growth are shown in (Figure 2) Supplementation of milk with skim milk powder had a negative effect on the growth of L. acidophilus (Figure 2a). Thus, the population growth of this strian was significantly higher in milk without skim milk powder supplementation (0.52 log cycles) than in milk supplemented with the third level of it (0.39 log cycles). This was not surprising because a factor reported to limit the growth of probiotic bacteria in milk is that they have low levels of proteolytic activity. Thus, increasing total solid may restrict the growth of L. acidophilus. As shown in Figure 2b, supplementation of milk with skim milk powder had a slight effect on the growth of S. Thermophilus . Anyway, the population of this strain was also higher in milk without skim milk powder supplementation compared with the second and the third level of it (1.57 log orders instead of 1.45 and 1.46 log orders, respectivly). In contrast, the growth of L. delbrueckii ssp. bulgaricus was significantly increased in milk supplemented with skim milk powder (Figure 2c) and the growth of this strain was over 0.1 log cycle higher in milk supplemented with skim milk powder in its third level compared to the second level. It domenstrated that higher total solid, enhanced the growth and activity of L. delbrueckii ssp. bulgaricus because of its proteolytic nature. L. acidophilus is reported to be less proteolytic than S. Thermophilus and L. delbrueckii ssp. bulgaricus and it is well stablished that the latter organisms produces amino nitrogen for the former organism showed that a high total solid level should be used to achieve high growth of S. Thermophilus and L. paracasei. Furthermore, Radke-Mitchell and Sandine (1986) have also shown that the growth of S. Thermophilus is favoured in a high total solid environment most likely due to enhanced buffering capacity of the medium but, in this work only the growth of L. delbrueckii ssp. bulgaricus enhanced in high total solid milk. Figure 2. The results of this study about the effect of adding skim milk powder and whey powder on the bacterial growth (a): Effect of skim milk powder on the growth of Lactobacillus acidophilus (b): Effect of skim milk powder on the growth of S Streptococcus thermophiles (c): Effect of skim milk powder on the growth of Lactobacillus bulgaricus (d): Effect of whey powder on the growth of Lactobacillus acidophilus (e): Effect of whey powder on the growth of S Streptococcus thermophiles (f): Effect of whey powder on the growth of Lactobacillus bulgaricus. Whey is a by product of the cheese industry, which is often used as an ingredient in yoghurt manufacture. It apparently provided a more readily available source of peptides or amino acids needed for growth of the probiotic cultures which can stimulate the weakly proteolytic probiotic strains . Whey proteins are also rich in sulfur-containing amino acids, which are liberated during heat treatment, and these sulfur-containing amino acids lower the redox potential and favour the environment for the probiotic growth. Our results have shown that the supplementation with industrial whey powder, adversly affected the bacterial growth (Figure 2). The growth of L. acidophilus, S. Thermophilus and L. delbrueckii ssp. bulgaricus, were much greater in milks without whey powder supplementation. Numbers of L. acidophilus growth were significantly higher in milk with no whey powder. Although increasing whey powder from the second to the third level enhanced the L. acidophilus growth; the highest growth was still achieved when whey powder did not use in the formula (Figure 2d). In the case of S. Thermophilus , the absence of whey powder increased the bacterial growth to 1.74 log cylce (Figure 2e) and an increase in L. delbrueckii ssp. bulgaricus growth of about 0.22 log units was also observed in the fermented milks without whey powder supplementation compared with the second level of it (Figure 2f). Thus, the lower cell counts were obtained with whey powder supplementation and it showed negative effect on the bacterial growth. On the whole, the most pronounced effect of milk base supplementation was observed with the probiotic strain. In agreement with our results, Oliveira et al. (2001) claimed that the lower cell counts were obtained with casein hydrolysis supplementation. Lucas  also showed the negative effect of milk supplementation with protein hydrolysate on the growth of some strains of probiotic bacteria when they are co-cultured with S. Thermophilus and they stimated that S. Thermophilus had a higher stimulation than the probiotic bacteria. In another study, Sodini showed that milk supplementation establishes a higher stimulation of S. Thermophilus rather than the probiotic lactobacilli. However, Kailasapathy and Supriadi  showed that the effect of different total solid levels on the growth of L. acidophilus in yogurt during fermentation was non-significant. Inoculum size of probiotic bacteria is an important key factor to ensure sufficient viable cells in the final food product . The results from published reports also stress the importance of careful selection of probiotic cultures before they are combined with traditional yoghurt cultures to produce an acceptable probiotic dairy product. Furthermore, selection of the yoghurt cultures for such milk products is important to help maximize the number of probiotic bacteria in the final product. Figure 3 represents the effect of L. acidophilus and yoghurt inoculums on the growth enhancement of the bacteria. 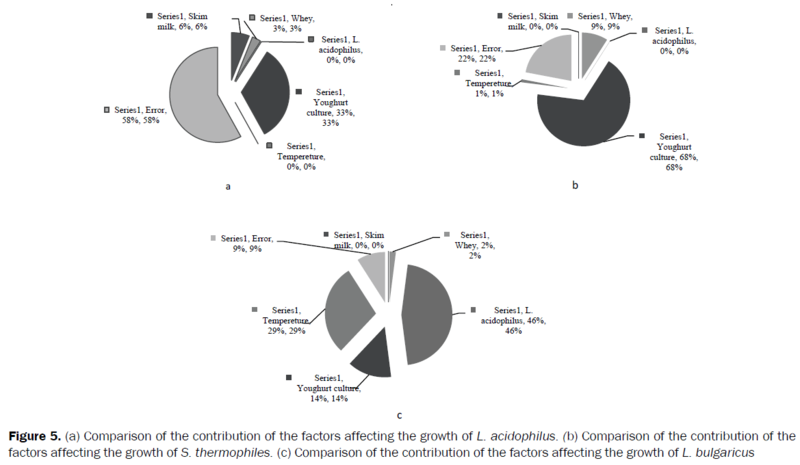 In the case of L. acidophilus inoculum effect, the growth of L. acidophilus and S. Thermophilus was not significantly affected (Figure 3a, 3b). However, the probiotic growth was higher when L. acidophilus inoculum size was the lowest. Furthermore, the addition of L. acidophilus significantly reduced the growth of L. delbrueckii ssp. bulgaricus and the lowest growth of L. delbrueckii ssp. bulgaricus was achieved by the third level of L. acidophilus inoculum and there was more than 1 log cycle increase in growth number of L. delbrueckii ssp. bulgaricus when L. acidophilus was added to the milk at its first level and the growth increase from 2.68 log cycle to 3.62 log cycle by reducing the inoculum size of L. acidophilus from the third to the first level (Figure 3c). Figure 3. Effect of Lactobacillus acidophilus and yoghurt inoculums on the growth enhancement of the bacteria (a): Effect of Lactobacillus acidophilus on the growth enhancement of Lactobacillus acidophilus (b): Effect of Lactobacillus acidophilus on the growth enhancement of Streptococcus thermophiles (c): Effect of Lactobacillus acidophilus on the growth enhancement of Lactobacillus bulgaricus (d): Effect of yoghurt culture inoculum on the growth enhancement of Lactobacillus acidophilus (e): Effect of yoghurt culture inoculum on the growth enhancement of Streptococcus thermophiles (f): Effect of yoghurt culture inoculum on the growth enhancement of Lactobacillus bulgaricus. Yogurt inoculum size is the strongest factor influencing the variation in the cell number of L. acidophilus, S. Thermophilus and L. delbrueckii ssp. bulgaricus as supported by Figure 3. Many researchers have emphasized the importance of selecting an optimal support culture for probiotic bacteria to ensure high viable numbers of the probiotic cells throughout the manufacturing process and the entire shelf life period of the product. As it is shown in Figure 3 the third level of yoghurt culture inoculum, resulted in lower growth in cell counts of almost all the bacteria tested. It could be explained by a mechanism of nutritional competition. For L. acidophilus growth (Figure 3d), the effect of yogurt culture was highly significant, with higher generation numbers when the second level of yogurt inoculum size was used, instead of the third and the first level (0.54 log cfu mL−1 versus 0.29 and 0.51 log cfu mL−1, respectivly). It appears that addition of proteolytic strain of L. delbrueckii ssp. bulgaricus had an important effect and a better growth was observed with the second level compared to the first level, possibly due to liberation of peptides and amino acids required by less proteolytic probiotic bacteria. But by increasing the yogurt inoculum from second to third level, the growth of L. acidophilus reduced drastically and reached to 0.29 log cycle. As reported previously by Lourens-Hatting and Viljoen, if a higher inoculation percentage of S. Thermophilus and L. bulgaricus is used during fermentation, these cultures will dominate the fermentation and result in lower populations of L. acidophilus and B. bifidum in the final product. This also may have been due to rapid acid production by the yoghurt cultures that could have a detrimental effect on growth of L. acidophilus due to sensitivity of this strain to acid conditions created by the yoghurt cultures, McComas and Gilliand. Thus, the best yoghurt inoculum size to achieve the highest L. acidophilus growth was the second level that is recommended by the culture producer as yoghurt inoculum size in yogurt productions (0.2 U mL-1). Figure 3e shows that, S. Thermophilus multiplication in yogurt is higher once we have the lower concentration of inoculum. Thus, the growth of S. Thermophilus appeared to be affected the most when yogurt inoculum was at the first level and there was roughly a 1 log cycle increase in the growth population of this strain when the inoculum decreased from the third to the first level. However these results were in contradiction with those reported Oliveira who observed no differences, in the counts of S. Thermophilus , for mixed cultures, occurred in contrast to what is seen for the strains of probiotics. This was already reported for other cocultures of S. Thermophilus and L. acidophilus by Dave and Shah. Furthermore, L. delbrueckii ssp. bulgaricus might be more active in samples prepared with less concentration of the inoculum (Figure 3f). This effect can be due to a phenomenon of competition between the strains, which could slow the growth when they are cultured with the higher inoculum size. Incubation temperature is also an important factor related to bacterial growth. Usually, yogurt is fermented at 43°C (the optimal temperature for lactic acid production by starter cultures); however, the optimum temperature for growth of probiotic strains is 37°C . Consequently, lower incubation temperatures will favour the growth rate and survival of probiotic species. In this study, growth of the strains varied considerably according to incubation temperature (Figure 4). Figure 4a shows that the highest increase in the number of L. acidophilus is achieved at 37°C with an increase in the cell number of up to 0.48 log cycles. This is in agreement with the suggested fermentation temperature (37-40°C) of fermented products containing probiotics, since this is the range in which most probiotics multiply well . No significant differences (P<0.05) were found among 40 and 43°Cfor the ability to enhance the L. acidophilus growth by 0.43 and 0.44 log orders, respectively. Maximum increase in the number of S. thermophilus at the end of fermentation was achieved when incubation took place at temperature 40°C and higher temprature (43°C) seems to reduce the growth of this strain (Figure 4b). Fermentation temperature positively affected the increase in the number of L. delbrueckii ssp. bulgaricus (Figure 4c) and the growth of this strain was significantly stimulated by high incubation temprature. This is expected if one considers that yoghurt strains are mostly mesophilic. Only their growth was favoured at high fermentation temperature (43°C ). Other reports presented that the stability of the number of viable probiotic cells was best at 30 and 37°C compared to 45°C and after incubation at 45°C a reduction in viable cells was observed for Lb. acidophilus La5, 1748, Lb. rhamnosus GG and Lb. reuteri SD 2112. Figure 4. 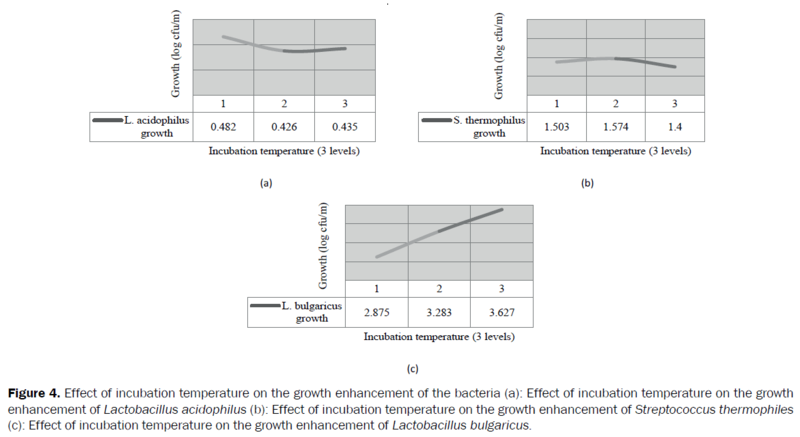 Effect of incubation temperature on the growth enhancement of the bacteria (a): Effect of incubation temperature on the growth enhancement of Lactobacillus acidophilus (b): Effect of incubation temperature on the growth enhancement of Streptococcus thermophiles (c): Effect of incubation temperature on the growth enhancement of Lactobacillus bulgaricus. Once the growth of L. acidophilus is taken into account, the highest rate of contribution is reported to be the effect of yogurt inoculum as it is illustrated in Figure 5. Among the various elements which cause this effect, the share of yogurt inoculum compared with other elements for this effect reaches up to over 78% of the total. While the effect of temperature and L. acidophilus seems to be the lowest. Meanwhile whey powder and skim milk powder with the effect of 7.14% and 14.29%, respectively, enjoy an average effect in this phenomenon. The comparison of the contribution of the factors affecting the growth of L. delbrueckii ssp. bulgaricus and S. Thermophilus indicates that yogurt inoculum has had the highest range of effect on the growth of S. Thermophilus ; while, L. acidophilus inoculum has been reported to be the most significant factor on LB growth. Temperature has had a very slight role in S. Thermophilus growth, but its effect on LB growth has been a considerable one. Finally, skim milk powder and L. acidophilus have had the lowest effect on S. Thermophilus growth, while the lowest effect belongs to skim milk powder and whey powder in the growth L. delbrueckii ssp. bulgaricus (Figure 5). Generally speaking, yogurt inoculum possesses the greatest contribution in the growth of L. acidophilus and S. Thermophilus , but in the growth of L. delbrueckii ssp. bulgaricus the highest effect belongs to L. acidophilus inoculum and yogurt inoculum, after temperature, stands as the third influential factor. The primary role of lactic acid bacteria is to utilise lactose as a substrate and convert it into lactic acid during fermentation of milk. In all the runs of Taguchi approach, as a result of the microorganisms' activity, the acidity rose and the pH dropped after fermentation (Figures 6 and 7). Depending on the milk composition, starter culture and fermentation temprature, acidity and pH values of these products varied between 82 and 164 °D and between 3.98 and 4.47 respectively, at the end of fermentation time (data not shown). Figure 6. Increasing in acidity after fermentation. Figure 7. Dropping in pH after fermentation. The results concerning the effect of milk supplementation on acidification and pH changes are summarized in Figure 8. The acidification and pH decrease was drastically affected by skim milk powder. The third level of skim milk powder, significantly increased the acid production during incubation and by reducing the skim milk powder from 3 to 1 level, acid production decreased from 109.89 to 89.81 units, while pH decrease got higher from 2.00 to 2.12 units. (Figure 8a, 8b) While whey powder had no significant effect on acidity increase (Figure 8c); however as it shown in Figure 8d, the addition of whey powder significantly reduced the pH decrease during incubation (2.00 unit for the third level instead of 2.09 unit for the first level). As it is clear, the effect of total solid enhancement on acid production and pH decrease was completely reverse. As claimed previously by Kailasapathy and Supriadi, supplementation with skim milk powder and whey powder in yogurt mix will increase the lactose content. Lactose is utilised during the fermentation process and the acidification and consequentely pH decrease enhanced. Thus in agreement with Lucas supplementation, stimulated acidification and reduced fermentation time. Furthermore it had been shown that addition of skim milk powder, produced a yoghurt with high buffering capacity that retarded the normal yoghurt pH decrease during storage, resulting in improved of survival of viable bacteria (Kailasapathy and Supriadi, 1996). Lower total solid (the first level of skim milk and whey powder supplementation) means lower buffering capacity, which in turn means a higher decrease in pH for the same amount of acid produced and vice versa. It became evident that the main contributions to the acidification rate originated from skim milk supplementation. Figure 8. Effect of milk supplementation on acidification and pH changes (a): Effect of skim milk powder on acidification (b): Effect of skim milk powder on pH (c): Effect of whey powder on acidification (d): Effect of whey powder on pH. The acidification of fermented milks is strongly related to the composition of the starter culture (Figure 9). It has been shown that mixed starter cultures, composed of S. Thermophilus and L. delbrueckii ssp. bulgaricus with a probiotic strain (L. acidophilus or L. rhamnosus) presented a high interaction factor and permitted a short fermentation time (Sodini, et al., 2002). The acid production and pH decrease of the products inoculated with the third level of pure cultures of L. acidophilus reached 104.47 and 2.08 units, instead of 98.28 and 2.07 units with the first level of it, respectively (Figures 9a and 9b). Thus, the acid production was significantly stimulated by increasing the L. acidophilus inoculum size and the pH decrease also reached its maximum, when L. acidophilus inoculum was at the third level. Figure 9. Effect of Lactobacillus acidophilus inoculation percentage and yoghurt inoculum on acidification and pH changes (a): Effect of L. acidophilus on acidification (b): Effect of L. acidophilus on pH (c): Effect of yoghurt inoculum on acidification (d): Effect of yoghurt inoculum on pH. Figure 9c shows that yogurt inoculum enhanced the acidification significantely and the lowest acidification achieved at the first level of it. Furthermore, yogurt inoculum at its third level enhanced pH decrease drastically and the L. acidophilus inoculum effect on pH decrease, showed the same pattern as the yogurt inoculum effect on this dependent variable and the lowest drop in pH was observed when the inoculum size was at the second level (Figure 9d). It has been shown that probiotic bacteria in pure culture displayed the slowest acidification rate taking long time to drop the pH of milk to 4.5. Thus, the time to reach the desired pH could be considered too long for industrial applications because it could allow contamination (Oliveira, 2001). In some cases the combination of the probiotic culture and the support culture enhanced the acidification rate (Kang et al., 2012). The acidification and pH decrease were significantly affected by incubation temperature (Figure 10). 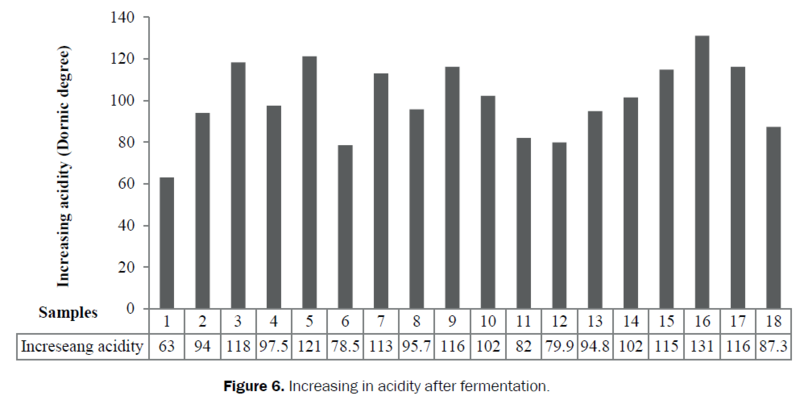 The highest increase in the acid production and pH decrease were achieved at high fermentation temperature (43°C) and the acid production increased from 89.97 to 113.33 and pH decrease from 1.96 to 2.10, when incubation temperature reached from 37 to 43°C (Figure 10a, 10b). Thus, High fermentation temperature favoured the achievement of acidification rate and samples fermented at 43°C showed a faster reduction in pH compared with samples incubated at 37°C. This observation agrees with Ostlie et al. (2004), who studied production of probiotic fermented milk and observed that products incubated at 45°C showed a faster reduction in pH early in the fermentation period rather than lower incubation temprature. In other study, similar effects of fermentation time on the acidification rate have also been shown . Figure 10. Effect of incubation temperature on acidification and pH changes (a): Effect of incubation temperature on acidification (b): Effect of incubation temperature on pH. The effect of milk supplementation, starter culture composition and fermentation temperature on growth probiotic and starter culture as well as acidification and pH decrease were studied in a synbiotic yogurt. The results showed that added skim milk powder which is the reagent of raw milk solids, has no significant effect on bacterial growth. But the growth of L. bulgaricus, showed a slow increases while L. acidophilus and L. thermophilus, growth reduces. These results are inconsistent with achievements of Kristo et al. in 2003 which the increasing of raw milk solids percentage on growth of L. casei was evaluated properly. Instead, their results confirmed that increasing the medium buffering property due to the effect of increasing the solids. Thus, while increasing skim milk consumption significantly increases the acidification but the drop in pH is decreasing and pH at the end of fermentation reduces less. Other findings of this study are a significant increase in speed and strength of the acidification by increasing of the percentage of raw milk solids. Increasing milk nutrient, lactose and proteins leads to increasing of acidification speed, but prevent the pH drop. It can be predicted that increasing the percentage of whey powder can increase the growth of bacteria. According to the specified composition for this enrichment, increase the percentage of whey proteins, growth factors, more favorable original L. Acidophilus is. However, research data implies no effect of protein hydrolysis of milk and whey proteins, although is ineffective on L. acidophilus growth but increases the growth of S. Thermophilus to 0.3 logarithmic and raises the acidification. In 2000 Maurier research indicates increasing speed of acidification in fortified milk powder with whey and milk proteins hydrolysis (Maurier, 2000). In this study, addition of whey powder, there was no effect on acidification, moreover, while increasing the buffering properties of culture will prevent the pH drop. When the numbers of bacteria in the culture are high, food sources in the culture are lacking. Lactobacillus provides their required nitrogen compounds, when competing bacteria with large numbers consume prepared resources. Producing bacteria besides energy consumption, don't achieve their nutrients to reinvigoration and reproduction and suddenly, its growth will be limited. Instead increasing L. acidophilus inoculation, acidification raises and meanwhile breaking and producing more compounds that cause acidity, so acidity raises and falling pH increases. Similar results of christo's investigations also reveal that acidification speed rises with increasing in inoculation. Increasing yoghurt inoculation in culture reduces L. bulgaricus and S. Thermophilus significantly. Lack of nitrogen resources in medium culture and competition to obtain these resources, has a negative impact on growth. But its impact on the growth of used probiotic is interesting. In this study it was found that increasing of bacteria present in yogurt from 2% to 4% raises L. acidophilus growth, but when the number of bacteria is higher than it (4% to 8%), sudden drop in the growth of probiotic is seen. So regulation of bacterial inoculation is important here. The higher inoculums, acidification and pH drop markedly increased. Production of lactic acid and effective compounds in create acidity which are derived from the breakdown of proteins, is effective on the marked increase acidity. The optimal temperature for the L. acidophilus, S. Thermophilus and L. bulgaricus were 37, 40 and 43°C, respectly, these results are based on specific characteristics of each species and the maximum growth of each is created in its optimum temperature. Therefore, it can be suitable for the growth of probiotic bacteria and limit the growth of others by adjusting incubation temperature on 37°C. Also acidification significantly increases with temperature rising. Although increased temperature with increasing acidification and decreased fermentation time is appropriate from economic viewpoint, but reduces the growth of probiotics. We would like to thank the national nutrition and food technology research institute (NNFTRI), and Shahid Beheshti University of Medical Sciences of Iran for financial support of this research studental project of MSc. Caselli M et.al Recombinant probiotics and their potential in human health. Int J Probiotics Prebiotics(2012)7: 53-58. Masci E Bacteria and intestinal health in adult and pediatric population: Moving from the field of alternative medicine to evidence-based treatment. Int J Probiotics Prebiotics (2013) 8: 1-48. Robinson RK Therapeutic properties of fermented milks, Elsevier Applied Science(1991). Ostlie HM et.al Effect of Temperature on Growth and Metabolism of Probiotic Bacteria in Milk. Int Dairy J (2004)15: 989-997. Vinderola CG et.al Survival of probiotic microflora in argentinian yoghurts during refrigerated storage. Food Res Int(2000)33: 97-102. Soodbakhsh S et.al Viability of encapsulated Lactobacillus casei and Bifidobacteriumlactis in synbiotic frozen yogurt and their survival under in vitro simulated gastrointestinal conditions. Int J Probiotics Prebiotics (2012) 7: 121-128. Shihata A, Shah NP Influence of addition of proteolytic strains of Lactobacillus delbrueckii subsp. bulgaricus to commercial ABT starter cultures on texture of yoghurt, exopolysaccharide production and survival of bacteria. Int Dairy J (2000)12: 765-772. Gomes MP et.alGrowth enhancement of Bifidobacteriumlactis Bo and Lactobacillus acidophilus Ki by milk hydrolyzates. J Dairy Sci(1998) 81: 2817-2825. Levin W Probiotics- The road map. Int J Probiotics Prebiotics (2011) 6: 133-140. Oliveira MN et.al Effect of milk supplementation and culture composition on acidification, textural properties and microbiological stability of fermented milks containing probiotic bacteria. Int Dairy J(2001)11: 935-942. Sodini I et.al Effect of milk base and starter culture on acidification, texture, and probiotic cell counts in fermented milk processing. Journal of Dairy Science (2002) 85: 2479-2488. Dave RI, Shah NP (1998) Ingredient supplementation effects on viability of probiotic bacteria in yogurt. Journal of Dairy Science (1998) 81: 2804-2816. Kang X et.al Effects of orally administered milk fermented by Streptococcus thermophilus mn-zlw-002 on murine cell-mediated immune response. Int J Probiotics Prebiotics(2012) 7: 59-64. Gomes MP, Malcata FX Bifidobacterium spp. and Lactobacillus acidophilus: Biological, biochemical, technological and therapeutical properties relevant for use as probiotics. Trends in Food Science & Technology (1999) 10: 139-157. Tammime AY, Robinson RK Yoghurt: science and technology(1999). Radke-Mitchell LC, Sandine WE Influence of temperature on associative growth of Streptococcus thermophilus and Lactobacillus bulgaricus. J Dairy Sci(1986) 69: 2558-2568. Kristo E et.al Modeling of rheological, microbiological and acidification properties of a fermented milk product containing a probiotic strain of Lactobacillus paracasei. Int Dairy J (2003) 13: 517-528. Logothetis N, Wynn HP Quality through design: Experimental design, off line quality control and Taguchi’s contribution (1989) (Oxford: New York: Clarendon press). Vinderola CG, Reinheimer JA Culture media for the enumeration of Bifidobacteriumbifidum and Lactobacillus acidophilus in the presence of yoghurt bacteria. Int Dairy J (1999)9: 497-505. Detection and enumeration of Lactobacilus acidophilus culture media. IDF Bulletin, (1995) 306: 23-33. Bongaerts G, Severijnen R Probiotics: are they incredible panaceas? On the science behind beneficial non-pathogenic microbial agents. Int J Probiotics Prebiotics (2007) 1: 87-96. Shah NP Probiotic Bacteria: Selective enumeration and survival in dairy foods. J Dairy Sci(2000) 83: 894-907. ChandanR Enhancing market value of milk by adding cultures. J Dairy Sci(1999)82 :2245-2256. McComas KA, Gilliand SEGrowth of Probiotic and Traditional Yogurt Cultures in Milk Supplemented with Whey Protein Hydrolysate. Food Microbiol and Safe(2003) 68: 2090-2095. Lucas A et.al Probiotic cell counts and acidification in fermented milks supplemented with milk protein hydrolysates. Int Dairy Journal (2004)14: 47-53. Kailasapathy K, Supriadi D Effect of whey protein concentrate on the survival of Lactobacillus acidophilus in lactose hydrolysed yoghurt during refrigerated storage. Milchwissenschaft (1996)51: 565-568. Lourens-Hattingh A, ViljoenBC Yogurt as probiotic carrier food. International Dairy Journal (2001)11: 1-17. Shortt C The probiotic century; historical and current perspectives. Trends in Food Science and Technol(1999)10: 411-417. Sarrela M et.al Probiotic bacteria: Safety, functional and technological properties. Journal of Biotechnol(2000) 84: 197-215.